When did land-loving humans first trust their fates to simple rafts and begin exploring the world by water? Most archaeologists would say some 50,000 years ago, when anatomically modern humans sailed from island southeast Asia to Australia. But Thomas Strasser, an archaeologist at Providence College in Rhode Island, dropped a bombshell last week at the annual meeting of the Archaeological Institute of America. Strasser reported that he had found several hundred double-edged cutting tools on the island of Crete that dated to at least 130,000 years ago. 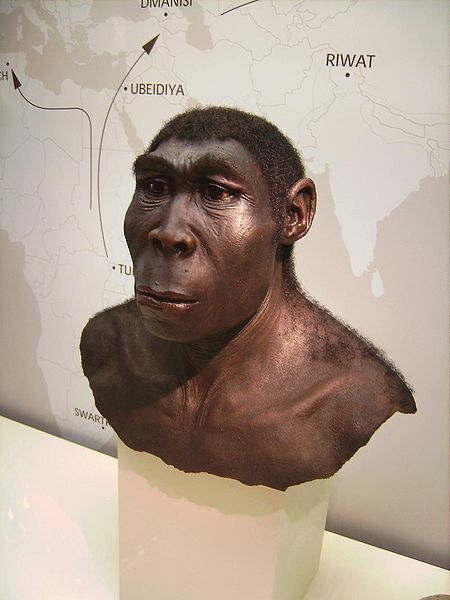 Some, said Strasser, looked very much like the hand-axes that Homo erectus wielded in Africa 800,000 years ago. Strasser now proposes that the ancient hominins voyaged out of Africa by primitive boat, island-hopping from Crete to Europe. “We’re just going to have to accept that, as soon as hominids left Africa, they were long distance seafarers and rapidly spread all over the place,” Strasser told Science News reporter, Bruce Bower. This new evidence sounds immensely intriguing, and I would certainly like to know much more. But I think that we are still a long way from seeing Homo erectus as a seafarer. Other evidence for such primeval ocean voyaging, after all, is very thin. Let me briefly recap. In 1998, a team led by Michael Morwood, an archaeologist at the University of New England in Armidale, Australia, excavated stone tools on the island of Flores in Indonesia (the same island that produced the so-called “Hobbit” remains of Homo floresiensis) that dated to some 800,000 years ago. This was the time period when H. erectus was roaming southeast Asia. How did the ancient hominin get to Flores? Morwood himself suggested that they might have held on to logs as simple flotation devices, and kicked their across the narrow strait separating Komodo from Flores. But a more flamboyant researcher, Robert Bednarik, an independent scholar who heads The First Mariners project, proposes that H. erectus sailed there by raft. To demonstrate that such a voyage is indeed possible, Bednarik and several associates built a bamboo raft with paleolithic stone tools, and then sailed successfully on it from Lombok to the neighboring island of Sunbawa in a ten hour and twenty five minute crossing in rough seas. So such a voyage is indeed possible in a simple raft. But most archaeologists working on the subject of coastal migration have been exceedingly reluctant to buy into the idea of seafaring H. erectus. When I interviewed half a dozen of the world’s leading experts on the subject two years ago while working on an article on ancient seafaring for Discover magazine, most suggested that that ancient hominins likely floated to Flores accidentally, after being blown out to sea in a storm. A major sticking point for many is the cognitive ability of H. erectus. Many researchers believe that only modern humans possessed the necessary technological creativity to build a raft and the requisite intellectual ability to navigate at sea. But if Strasser’s new findings are accepted (and you can be sure that people will be looking very carefully at both the stone tools themselves and at the proposed dates), then it could be a whole new ballgame. I personally will be following this research with great interest. It’s just my opinion, but I think archaeologists have tended to seriously over-estimate the cognitive challenges of simple, coastal use of boats. The basic principle is on display with every seagull sitting on a log. Fancy boats themselves are fairly complex (though not much more so than a basket is) and over-the-horizon navigation is cognitively challenging, but I am not sure I accept that Homo erectus getting themselves to Flores island is particularly remarkable. There is an equally long tradition of applying simple drifting mechanisms derived from seed dispersal biogeographic models to the spread of humans and these are deeply suspicious to me because they reserve agency for modern humans. I think something H. erectus had task-oriented agency. I mean, I’ve seen dozens of deer swimming from island to island in BC – it’s a pretty low bar to give them the desire, and an equally low bar to give them the ability. Shorter me: simple seafaring is not that hard and Homo erectus was not that stupid. The Crete data may or may not hold up, but the mental models of archaeologists need some serious adjustment imho. I definitely take your points here. But I’d guess that the longer the distance, the higher the bar becomes. The voyage from the coast of Libya to the southern coast of Crete is somewhere around 300 km today. (I’m afraid I don’t have any info here about the distance 800,000 years ago, when coastlines undoubtedly looked very different.) I don’t doubt that some wandering H. erectus set out from Libya bound for Crete, clinging to logs or even perching on simple rafts. Did they actually survive the crossing and make it to Crete would be the question. Yes, I agree Crete is a bit of a stretch, especially since there have been thousands of archaeologists running around on it for over a hundred years and there is a lot of soil exposure: sometimes negative evidence gains a bit of rhetorical power and some handaxes might have rolled out by now. Similar conditions on other large Mediterranean Islands like Cyprus and Sardinia have also not revealed anything older than terminal Pleistocene stuff (as far as I can recall, anyway). The Flores case is a bit different though – it’s in a complex, coastal archipelago (even with exposure of Sundaland) with very rich (compared to Mediterranean) near coastal zone; the Mediterranean doesn’t even have an intertidal zone; and Flores was relatively speaking much closer to populated shores. Basically, I think an argument could be made that Flores H.e. were preadapted and motivated in a user-friendly environment to do something not very cognitively challenging, while even late Pleistocene H.s. in the Mediterranean were none of these – hence their bigger brains were moot. Nonetheless, I too will be watching these Cretan developments with interest. Thanks for the post! It is not so far fetched since many animals such as lizards which can not swim hundreds of miles across the Ocean can hitch a ride on logs, debris from a storm to an island. Heather, if you’ve ever read any of Thor Hyerdahl’s books you will find that he proved early man could build boats out of reeds by tying bundles of reeds together with ropes. He made two boats and sailed accross the Atlantic. The first boat started sinking near the Carribean so he abandoned it and made a second one and tried again.He was successful the second time. Many mysteries of early man can be explained by accepting the fact that he could sail.